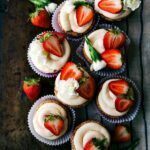 Delicious dairy-free and vegan strawberry and cream cupcakes. The toddler is fiiiiinally transitioning from his crib to a “big boy bed” as we’ve affectionately named it. With the transition has come quite a few melt-downs in the middle of the night out of fear of being in a completely new environment. He also hasn’t quite discovered yet that, unlike his crib, he is very able to get out of bed by himself. Instead he will yell “mama,” cry, or scream when he’s done with a nap or awake for the day. Anyways the other night I was awoken up to him crying. In a half-sleep daze I didn’t turn on any lights or grab my glasses (I’m basically blind without them) and rushed to his room. I keep those hallways very clutter free, so I didn’t even think there would be something in my way. However, apparently I’d missed the toddler moving his large plastic car into the hallway which I ran straight into, tripped onto, and landed completely face first on the floor. In a matter of minutes, the whole household was awake, because let me tell you, I do not handle unexpected 2-in-the-morning pain well. Or I suppose really any pain for that matter. A few screams and the husband was there, the baby was up and screaming, and the toddler was even more freaked out than before. At least the screams weren’t completely in vain as I do have some pretty great bruises, a swollen ankle, and a cut on my foot to show for it. All of which called for a lazy next day with lots of experimenting on making some delicious vegan cupcakes. Packed with fresh strawberries of course! Please, make some and send me a few along with some advice on getting a toddler completely OK in a “big boy bed” and potty trained. Any and all advice welcome! So let’s talk a little bit about these cupcakes because I’m pretty excited about the recipe! It was a bit of a challenge for me to create a dairy free cupcake since I usually load cupcakes and baked goods with all kinds of dairy — especially Greek yogurt! And eggs are pretty much always in my baked goods. Since I get quite a few comments from readers looking for dairy free baked goods, I thought this was a good place to start my experimenting! 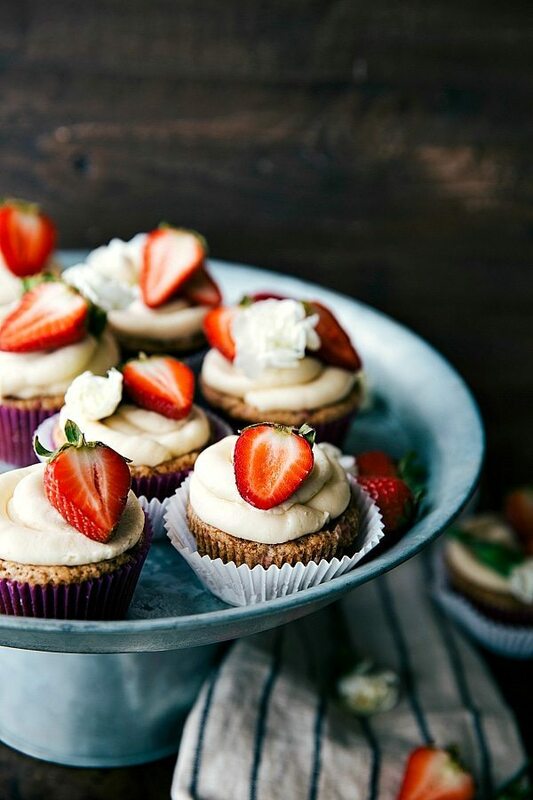 These cupcakes are not overly sweet and have a nice burst of strawberry flavor. 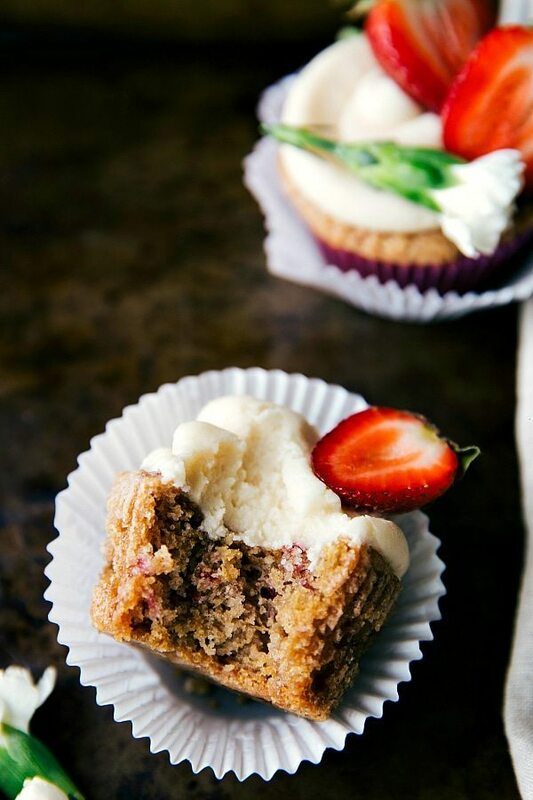 I also use some almond extract in the batter and the frosting which is a great complement to the strawberry flavor. Grease a muffin tin with nonstick spray, fill with muffin liners, and then lightly grease the liners. In a blender or food processor, pulse the chopped strawberries a few times to get a thick puree. Add to a bowl with butter. Melt the butter, measure it in melted form to reach 1/2 cup, and then let cool to room temperature. Add in the vanilla extract, almond extract, sugar, and apple cider vinegar. In another bowl add the baking soda, cornstarch, salt and flour. Stir. Add wet to dry and mix until combined. Fill the muffin cavities 2/3rds the way full and then bake for 20-25 minutes or until a toothpick comes out clean when inserted into the center. Remove and allow to completely cool. Meanwhile, prepare the frosting by beating straight out of the fridge butter with 1 cup powdered sugar until smooth. Add in the extracts and 1/2 to 1 more cup of powdered sugar (more powdered sugar for a thicker frosting and less for a lighter frosting). Beat until smooth slowly adding milk as needed to get to the right consistency. 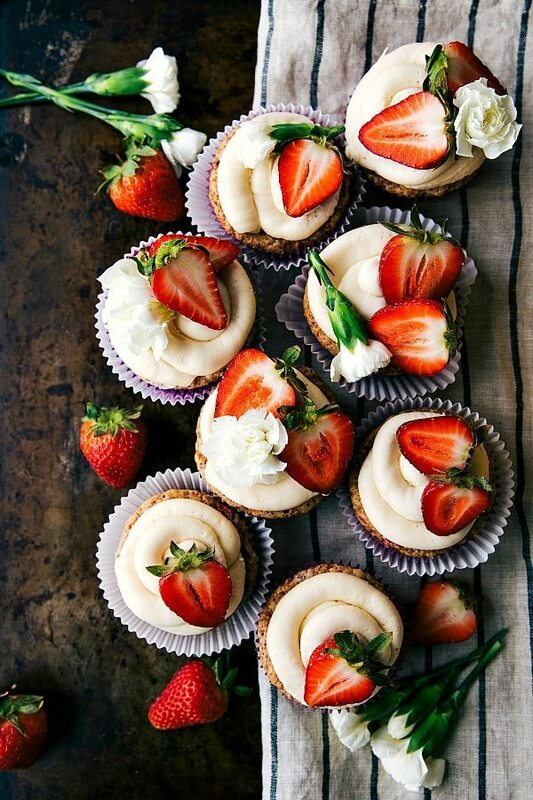 Frost the cupcakes and garnish with a sliced strawberry if desired. Thank you so much Medha!! Omg Girl! You totally captured the shock and awe effect with these beauties! 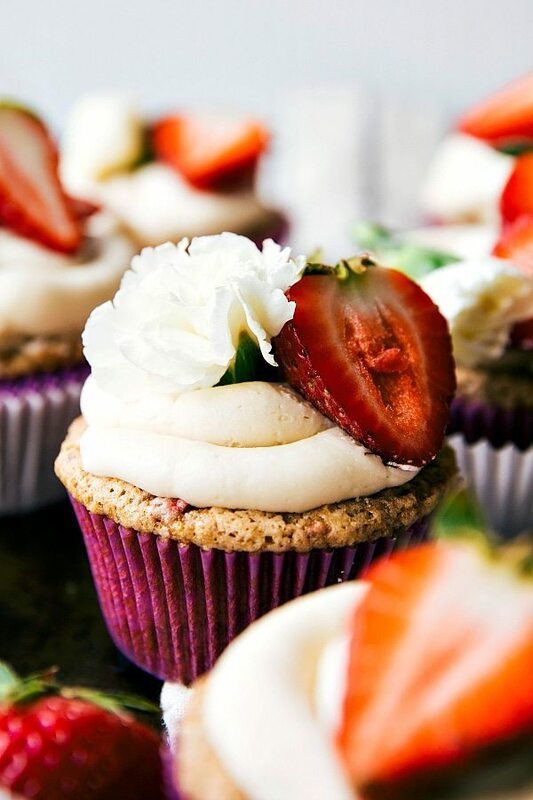 Your photos are flawless and I think I’m in love with these cupcakes! Yikes that’s definitely not how you want to wake up at 2am! But at least the following day resulted in this gorgeous dessert! I can’t believe these beauties are vegan. I’m seriously obsessed with your photos here too – the cupcakes are so beautiful. Wow these looks so good. What a gorgeous desert. You photos are awesome beautiful, my dear! I would like to try these but seem to have difficulty getting fully cooked, that is not mushy in the middle, GF cupcakes. What is the texture like? Are they light, dense, somewhere in-between? Just the best. So bloody nice. I used a little stawberry purée in the icing instead of milk and it looks and tastes great too. These look amazing! I really want to try but I can’t buy Earth Balance butter where I live. Would regular vegan margarine work? I use an olive oil margarine spread (Olivani). Or maybe coconut oil? I just made these on a whim and they were delicious. I was shocked to see that you did not use any of the usual egg substitutes in vegan recipes, such as applesauce or tapioca starch. Do you know what the specific part of this recipe makes up for the egg? I would love to use the same method in other recipes.